N64 Bomberman 64 (JPN) "100%" in 1:01:36.02 by zvsp. This run of Bomberman 64 achieves 100% status, which means earning 120 gold cards and all custom parts (alternate costumes for multiplayer modes). To acquire the prime "gold parts", players must obtain 120 gold cards within three hours of in-game time on hard mode. Watch zvsp blast through the stages and collect the cards very quickly. 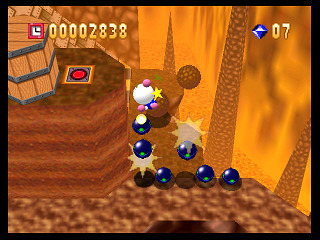 Many bomb-stacking glitches are used to skip areas. Some cards require killing a certain minimum number of enemies, so you'll also get to see Bomberman blow up lots of enemies. Also, the player dies on purpose several times, for deathwarps and as shortcuts for some cards in hazardous conditions. Also, see the any% run by Nahoc. For more Bomberman goodness, check out more Bomberman Movies.